Sailing at the crack of dawn to take advantage of the calm before the blow, Santa Barbara City College Ecological Restoration students joined Growing Solutions and the Montrose-funded Seabird Team in the continued extreme restoration of Santa Barbara Island, the furthest outpost of the Channel Islands National Park. The targeted task was removal of Mesembryanthemum crystallinum, crystalline iceplant, a distinctive species native to South Africa with centuries-long history of use and transport by sailors and oceangoing travelers. Crystalline iceplant is a hardy pioneer species that thrives in harsh coastal conditions, able to filter salt-laden air in poor soil. When the individual plants die they release stored salt into the soil, In the case of Santa Barbara Island it leaves the soil saltier than pre-iceplant soil and in some cases so salty even the iceplant can’t grow. Because of the increase in soil salinity the iceplant produces soil conditions to favor itself over native species that provide critical habitat for seabird nesting. 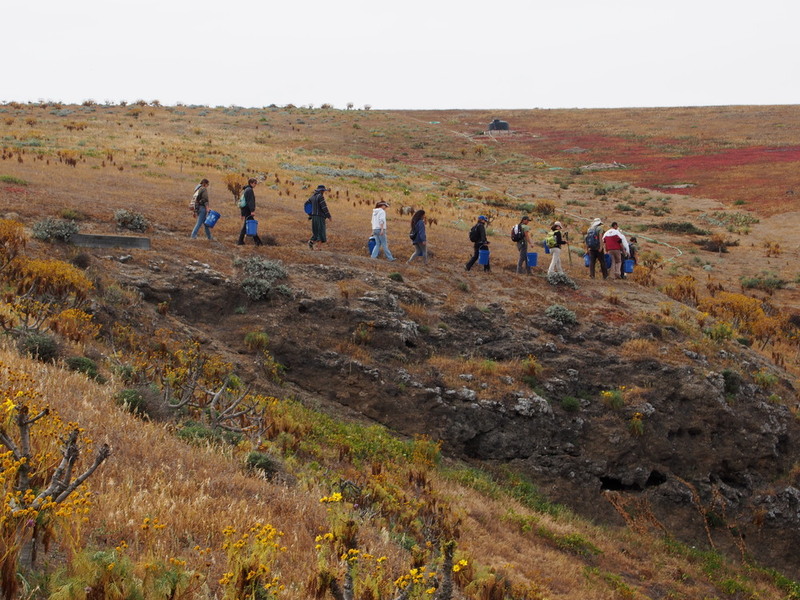 Over four sunny, windy days students and volunteers camped, hiked and weeded iceplant around native plants planted in the fall with the objective of restoring the native coastal bluff habitat. The hardy low-growing drought-tolerant plants (SBI only received three inches of rain this past season) are perfect cover and nesting habitat for threatened Cassin’s auklets and Xantus’ murrelets. Newer PostGroundbreaking SBCC Campus Garden!